Prime Minister Manmohan Singh today signalled an end to the persisting parliamentary deadlock over the Opposition�s demand for a Joint Parliamentary Committee (JPC) probe into the 2G Spectrum scam, saying he was looking forward to a �peaceful and productive Budget session�. The current flurry of political rallies in Punjab and the high decibel level of leaders, contrary to speculation, may not signal an early Assembly election in the state. 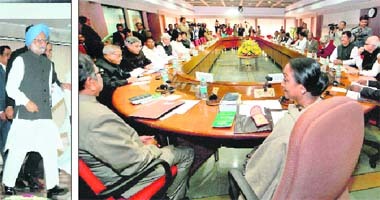 Due to be held before February, 2012, Congress leaders have been claiming that the SAD-BJP coalition government might prefer to prepone the election to October or November this year. The last time the Assembly poll was held in the state on February 13, 2007 and results were declared on February 27,2007. Observers point out that election for the all-powerful Shiromani Gurdwara Parbandhak Committee ( SGPC), scheduled to be held in May this year, is going to be the litmus test for the SAD-led government in the state. With the much-anticipated Airport Metro Express line likely to start operations from Wednesday, commuters will now be able to travel between Indira Gandhi International Airport and New Delhi Railway Station in just 18 minutes. Indians may get up to 20,000 UK visas a year under a deal it is negotiating with the European Union and in return India has put forward an annual �4-billion trade with the EU, media reported today. 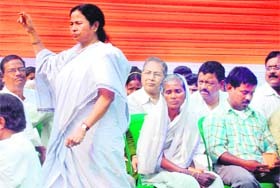 Ending uncertainty over her party�s alliance with the Congress ahead of West Bengal Assembly polls, Trinamool Congress supremo and Union Railway Minister Mamata Banerjee today said the tie-up would remain and asked people to dislodge the Left Front government after 35 years of �misrule�. The nation rejoiced as the Boys in Blue bulldozed Bangladesh into submission to begin their World Cup quest. It was a toast to the country and the over one billion people stood and applauded. The awesome batting display was ample testament that the Indian batting, along with Australia, is easily the best in world cricket. On screen he is a hero, whose action thrillers had earned him innumerable fans. He has rescued several damsels in distress on celluloid, but coming to the rescue of a political party was a new one for Chiranjeevi. 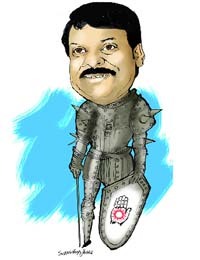 The Telugu superstar, whose career spans three decades, was a godsend for the Congress government in Andhra Pradesh as it faced the prospect of destabilisation from the rebel camp led by YS Jagan Mohan Reddy.